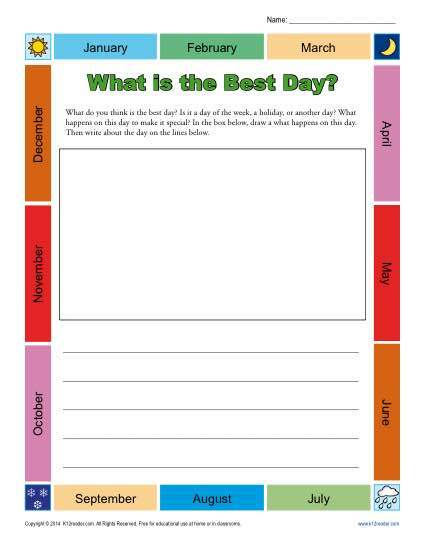 Kindergarten Writing Prompt - What is the Best Day? Writing Prompt – What Is the Best Day? This fun kindergarten opinion prompt asks your student to draw and write about a “best day.” It’s sure to evoke fond memories, as well as promote strong skills for that budding author. Instructions for the activity read: “What do you think is the best day? Is it a day of the week, a holiday, or another day? What happens on this day to make it special? In the box below, draw a what happens on this day. Then write about the day on the lines below.” It’s compatible with Common Core Standards for Kindergarten Writing, although other students and other grades may find it useful too.